Jan 25, 1945 ‑ Plane crashed on deck of carrier with us.... (U.S.S. Bon Homme Richard). Feb 1, 1945 ‑ Entered Christabel Harbor at 6:00 A.M. anchored at 7:30 A.M. Underway at 9:00 for the Panama Canal, Entered canal at 10:00 A.M. (Gatum Locks), Entered first locks at 10:30 A.M. these locks 75 ft. deep 2nd locks at 10:50 A.M. ‑ 3rd locks at 11:10 A.M. from 1st to 2nd lock is a lift of 41 ft. from 2nd to 3rd lift is 29 ft. 11:30 entered Gatum Lake Calelra Cut 1:00 P.M. Some of the mountains here are 500 to 1000 ft. high and this cut goes right through them. There is a railroad running along side of the canal. Entered Miguel Locks at 3:00 P.M. 1st locks 4:15 P.M. lowered 34 ft. to the second locks 6:35 P.M. 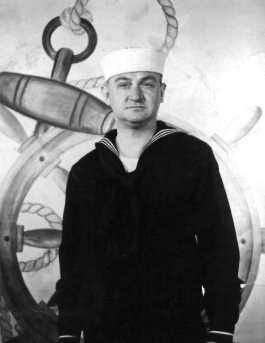 Entered the Pacific Ocean 6:35 P.M. Docked at Panama 8:30 P.M.
Feb. 11 still in Diego from 11th to 22nd of Feb.
Feb. 28, 1945 ‑ Have a 4 day leave starting today, wish I was in New York so I could get home but guess I will go to Sacramento. March 13, 1945 ‑ Underway at 7:00 A.M. and I am sleeping. Back to Mare Island today more trouble. March 16, 1945 ‑ 10:30 A.M. ‑ Here we go to sea again. April 5, 1945 ‑ set clocks back 1 hr. April 7, 1945 ‑ Guns fired at radio controlled plane. Well, well, USS Alabama along with us. Set clocks back 1 hr. April 9, 1945 ‑ Set clocks back 1 hr. April 14, 1945 ‑ Underway again, more training. Back again at 5:45 P.M. Oh me just here again, gone again. April 17, 1945 ‑ Had liberty and purchased my honey and babies some gifts. April 18, 1945 ‑ Gone out to sea again. April 21, 1945 ‑ *** underway for points west. April 22, 1945 ‑ man set clocks back 1 hr. April 24, 1945 ‑ 45 Tues.. set clock back 1 hr. Fired at a radio controlled plane at midnight tonight, we will jump from Tuesday to Thursday. There will be no Wednesday as we cross the date line. April 28, 1945 ‑ Sat. ‑ Anchored in Eniwetok in the Marshall Islands. Some Japs around here. April 30, 1945 ‑ Mon. Picked up a carrier and she is going with us. May 1, 1945 ‑ Tues.. Set clock back ½ hr. May 2, 1945 ‑ Passed Siapan at 6:00 A.M. Looked like about 200 merchant ships in the harbor. We had a submarine contact about 4:30 P.M. Now I am going to sleep. May 3, 1945 ‑ Thursday ‑ It is 4:00 P.M. nothing happened yet but day is not over. Out at sea and sea is still pretty calm. Hope things remain quite, but we are expecting an air raid anytime now. May 4, 1945 ‑ Friday ‑ Nothing happened yet today, but the day is not over yet, just 4:00 P.M., expecting an air raid anytime. May 5, 1945 ‑ Saturday ‑ Pulled into Okinawa about 11:00 A.M. 3 air raids up till 12 midnight. May 6, 1945 ‑ Pulling out of Okinawa for firing on a beachhead, at 6, 9 Jap planes overhead. Will finish as the day passes. May 6, 1945 ‑ Sunday ‑ Back in Okinawa again, will finish page up till 4:00 P.M. Japs have at last stopped pestering us for a couple of hours, but they will come a calling on us again to night I betcha. 7:50 P.M. Little yellow men here again. 8:30 P.M. another raid, they are playing hell with my sleep. May 7, 1945 ‑ Monday ‑ 2:30 A.M., another raid. 10:00 A.M., another raid. 2:00 P.M., no rain since ten this morning, but the Japs will be here tonight. They love us so much they just can't stay away. Better write a letter to my honey while things are quite. Well they stayed away long enough for me to write that letter to my honey. Wonder if I can get a shave and bath before they come again. Perhaps I can run out of the shower naked and scare them away. I am going to light a cigar. Maybe if the Japs come on so I can blow some smoke in their faces and they will choke. Germany finnis. May 8, 1945 ‑ Tuesday ‑ Just finished breakfast. No air raids since 10:00 A.M. yesterday. Guess they are mad at us because we shot back at them, but the day has just begun. Getting underway, don't know if we are just going to refuel or leave Okinawa. Boy did the Japs on Okinawa get hell last night. All you could hear were bombs and shells from our ships hitting the beach. May 9, 1945 ‑ Wednesday ‑ No air raid the last two days, but they are here again to night. It is 7:00 P.M.
>May 10, 1945 - Thursday - No sleep last night, Japs raided all night. It is 8:00 A.M. and I am going to try and get a little sleep today as I think tonight will be another hot night. May 11, 1945 - Friday - Pulled back into Okinawa and anchored at 12 noon. No sleep last night as the Japs were overhead all night. Were here again this morning. It is 12 noon, I am going on the top deck and try to get a few hours sleep, I hope. Wish I had a letter from my darling wife. Leaving here at 1600 for an island 100 miles from Japan. Going right into Tojo’s front yard. Taking a bunch of Marines there for an invasion. May 12, 1945 - One air raid early this morning, but the planes did not bother us. We walked right into Tojo’s front yard. Took an island away in about ½ hour shelled hell of the beach and thumbed our nose at Tojo. It is now 12 noon and no air raids since we took the island. It is 4:30 P.M., one bogie was over this afternoon, but they chased him away. Tori Shima now belongs to the U.S. There is an American flag flying from the highest point of the island. Tonight, almost 7:00 P.M., a Jap plane dived on us and tried to crash into us, but missed by almost 10 feet. That was too close. Four American planes were after him and he knew they had him so he tried to get us. May 13, 1945 - Sunday - One air raid this morning and a letter from my darling which I was so happy to get. May 14, 1945 - Monday - Received five letters from my honey last night and was so happy to get them. No air raids since 4:00 A.M. Still in Okinawa. Received two letters from my darling and one from the babies, and one from mother. 5:30, still no air raid since 4:00 A.M. Hope we don’t have any tonight, but guess they will come a calling again. May 15, 1945 - Tuesday - It is 5:00 P.M. and nothing happened yet today. Still in Okinawa, but moved to Wise Man’s Cove today. Just finished writing a letter to my honey. So far we have knocked down 3 Jap planes. May 16, 1945 - Wednesday - Nothing happened. Received a letter from mother. May 17, 1945 - Thursday - Up all night because of air raids. Nothing happened so far today. It is now 5:30 P.M.
May 18, 1945 - Friday - On GQ almost all night. Not much sleep came. Out on the picket line today between Okinawa and Formosa. Anything can happen out here. May 19, 1945 - Saturday - 4:00 P.M., nothing happened yet today, but the day is young. Did not bother us much last night. Only called GQ twice as we thought the nips were coming, but they must have went back before they reached us. Still at sea. May 20, 1945 - Sunday - Nothing happened today. A couple of alerts for air raids last night but no planes appeared. May 21, 1945 - Monday - Had to go to GQ twice today. No planes in sight. Last GQ today I had to dress running down the deck as when GQ sounded I was by my bunk putting on clean clothes, just finished taking a shower. It is now 5:20 P.M. and we have moved about 50 miles closer to Japan, guess there will be hell tonight. If there isn’t, I will be surprised and happy. May 22, 1945 - Tuesday - 12 noon, one air raid alert. Things were very quite last night, one air raid. A Val dive bomber came into sight, but did not attack. Maybe he was afraid we would shoot at him (huh). More later as the day passes. May 24, 1945 - Thursday - It is 12 noon, leaving Wise Man’s Cove and going back to Okinawa. ** are over this morning trying to get some wire. Will finish this page later. May 25, 1945 - Friday - Nothing happened last night and today. May 26, 1945 - Saturday - Received two letters from my honey, one from Jim and Rose in Philly. Rose told me her brother was injured in Okinawa. I am in Okinawa now, but can’t tell them. Strange things happen in strange places. May 27, 1945 - Sunday - No air raid alert last night, two today. May 28, 1945 - Monday - 3 air raids last night. A Jap sea plane snuck into the harbor this morning, but he did not leave here. A shell caught him, a big burst of flame, the end of one Jap. The Drexler was sunk on picket 15 this morning. She had traveled quite a few miles with us, but she is finished now. May 29, 1945 - Tuesday - They got us last night at 12:15 A.M. A Jap dive bomber hit us. My chest and back feel awful. Never do I want to see men suffer like they did last night. This morning they put us on a APD for transfer to an AP which is a troop transport. May 30, 1945 - Wednesday - On the troop ship still in Okinawa, feel awful sick. May 31, 1945 - Thursday - Leaving here this morning. I am glad to get out of here. Still in plenty of pain in my chest and back. June 1, 1945 - Friday - At sea, don’t know where we are going. June 2, 1945 - Saturday - Still at sea, hear we are going to Siapan. June 3, 1945 - Still at sea. We are supposed to pull into Siapan in the morning. Admitted to the 37th General Field Hospital on Siapan. Discharged from the Navy on Nov. 11, 1945 from the U.S. Naval Personnel Separation Center, Great Lakes, llinois.